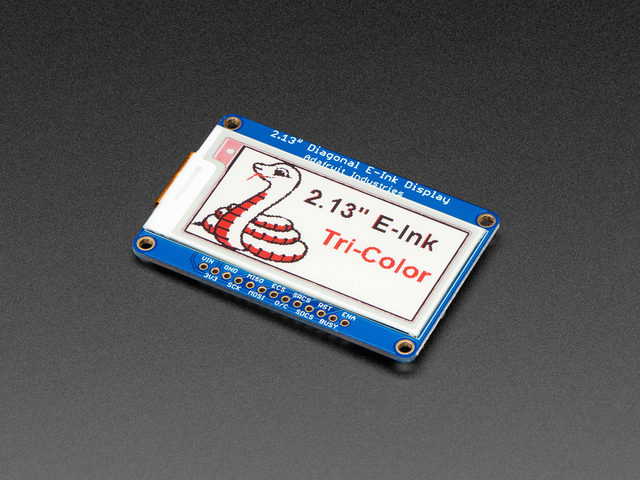 This breakout as a 2.13" tri-color (red, black and white) display. It has 212x104 black and red ink pixels and a white-ish background. Using our CircuitPython or Arduino libraries, you can create a 'frame buffer' with what pixels you want to have activated and then write that out to the display. Most simple breakouts leave it at that. But if you do the math, 212 x 104 pixels x 2 colors = 5.5 KBytes. Which won't fit into many microcontroller memories. Heck, even if you do have 32KB of RAM, why waste 6KB?